If there are 2 most important educators in China, the credit goes to Kongzi(Confucius) and Cai Yuanpei. Oddly enough, Cai Yuanpei is not very well known in current China by young people, so I went to dig some info at his former residence in Shanghai. It is hidden inside a very quiet leafy neighborhood, Spanish style building. The visit was quite amazing, Cai was born in a Chinese banker family but his father died when he was less than 10 years old, all they had at that time was an empty house, few money. But with hard study, he passed the imperial exam at the age of 18 and had an official job at the Qing government. However, he was disappointed with the useless government and decide to find a way saving China. Studied Japanese and German… went to Germany, and worked and studied over there for 4 years. Cai believed that he could find the answer. 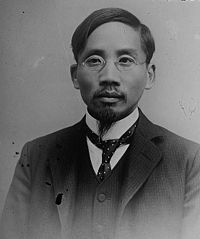 When Cai Yuanpei came back, he became the leading liberal educator of early twentieth-century China. He was also the principle of the Peking University. – Zhouen Lai, Chen Yi was sent by him to France, as part of the Hubei students group. – Mao Zedong(Chairman Mao)was working for Peking University as a Librarian admin, Mao also had the chance to study in France together with the Hubei group but he decided to stay in China and he tried to have a cleaner’s job at first. – The first Marxist group was started in Peking Univeristy. The founder member of the CCP: Cheng Duxiu and Li Dazhao both were the teachers at this university. Interestingly, Cai Yuanpei is a nationalist – KMT party member. This simply shows that he is an open-minded man. – Married 3 times, never divorced. – For the 2nd marriage, he wanted to find a woman with “heaven feet”(nature feet), educated, willing to remarry if he dies, willing to divorce if they don’t love each other, note that in 1900’s all woman has 3 inches feet in China, no divorce, not educated….however he find one, amazing, right? – The last wife of him is his student, with 24 years age difference, born 3 children for him, the youngest daughter was born when he was 60.